Phases are another tool you can use to keep your work organized. Every project goes through a process from start to finish. In some industries, this process is marked by stages. 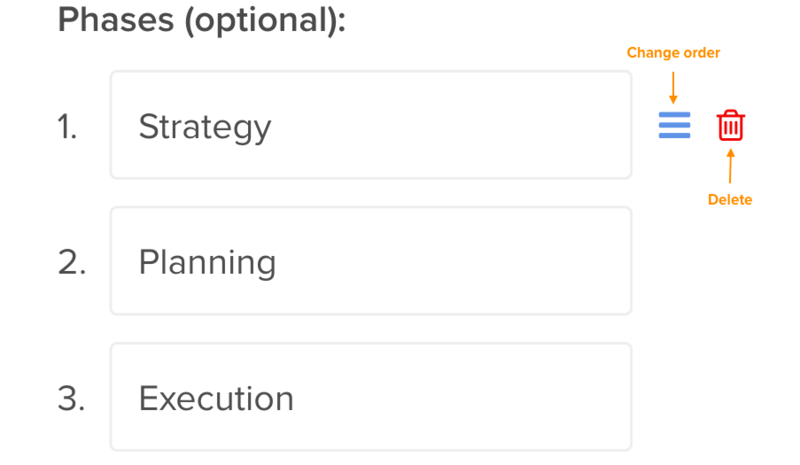 For example, a consulting project might have three phases: planning, execution, and closing. The planning phase will consist of all actions related to preparing for the engagement. It could include finding the resources needed and outlining a timeline. The execution phase could be implementing the plan and tracking project progress. The closing phase could include finalizing your deliverables, reporting on accomplishments, and doing a post-mortem. These are too general to be captured by a label. And unlike statuses, not every action goes through them. That's why we've created Hive phases. They are the perfect way to include these project stages in your Hive workspace. 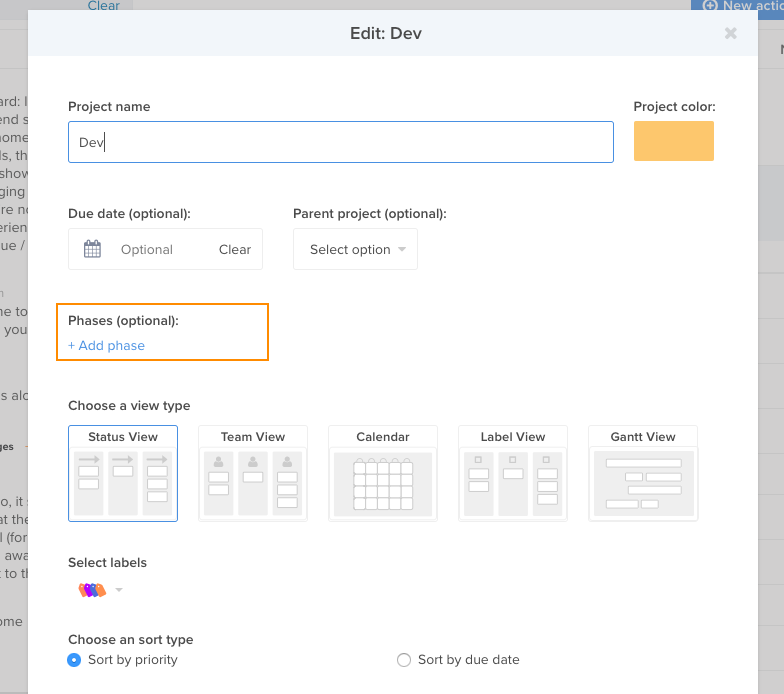 When adding phases to a new project, go to the project navigator, select "+ New Project", and in the new window click the link "+ Add phases"
For an existing project, go to the project navigator, press edit, and click the link "+ Add phases"
Once your projects has phases set up, you can use them to organize your actions. When you create a new action, it adds it to the first phase by default. You change an action's phase by clicking the dropdown menu at the top of the action card. 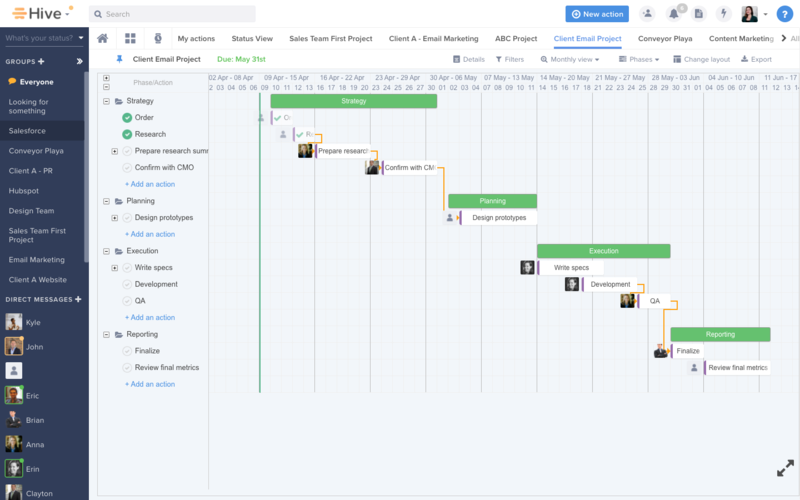 In gantt view, you can see your actions broken down by phase. Here you can use the "+Add an action" link to include items in each phase. You can also drag and drop to move actions from one phase to another. In status view, each the front of each action card is labeled with its phase. You can also filter the actions in your project by phase. In gantt view, you can group your actions by phase. 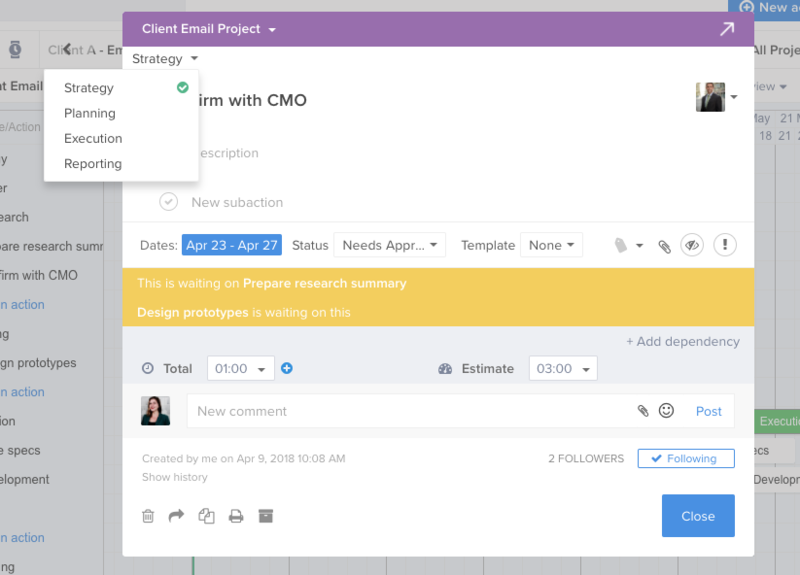 Go to the project navigator, hover over the project you want to change, press edit, and go the Phases section. There you can change the name of any phase, delete them, or add new ones.